Roncesvalles Area Yard Sale (RAYS! ): Our official RAYS 2009 poster! Our official RAYS 2009 poster! Can we print up our own posters/flyers & if so, what size does this one print at? Yes! You can totally print up your own posters/flyers. You should be able to specify the print size when you print it in whatever graphics program you use. If not, email me and I will help you out. Welcome to the Roncesvalles Area Yard Sale (RAYS) Blog! Hi and thanks for stopping by at the Roncesvalles Area Yard Sale (RAYS) blog! 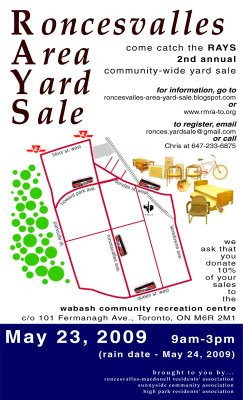 The 7th annual Roncesvalles Area Yard Sale (RAYS) is coming! Saturday June 14, 2014 (rain date = Saturday June 21). Sell your stuff from the comfort of your front yard (or garage)! Buy things from your neighbours! ! Bring your friends and let them explore one of the city's best neighbourhoods!